While construction, power and maintenance would be difficult, placing the laser array on the moon would reduce atmospheric instability, and tectonic interference on the laser station. Given the 50 year timeline, consideration should be given to a second stage booster, space based laser. Solar or nuclear/battery to increase speed which is effectively a multiplier of mission shots on a time basis as well as potentially a course correction " mission saver". This could also allow for increased mission mass. Laser efficiency and battery power density are also improving steadily. Eventually, a system will be identified that has life on an earth like planet. We will want to rapidly ramp up the number and complexity of missions. Second stage booster can orbit the sun at around 130 M miles and approx. perpendicular to Earth orbit with enough variance to allow missions to different areas of sky at different times of year. It may be better to have the beams movement set and the sail to correct for changes in position, the distance near the end of the acceleration phase will be to great to allow for accurate corrections. "It may be better to have the beams movement set and the sail to correct for changes in position, the distance near the end of the acceleration phase will be to great to allow for accurate corrections." Correct. Attitude, (but not position control) with photon thrusters (with no beam) is practical. The angular acceleration from 1W will rotate the sail by half radians in less than 500s. "While construction, power and maintenance would be difficult, placing the laser array on the moon would reduce atmospheric instability, and tectonic interference on the laser station." Will the laser array will have to be constructed in the southern hemisphere in order to aim at the Alphas Centauri system? Perhaps you can design the sail to use Bernoulli's Principle to keep it inside the beam. *Correction: It's actually called Coanda effect. In any case, Further research is needed and consulting experienced people in the field could tell us more on what may be possible with these principles. Maybe producing a spin, a perfected design, or considering the craft to be flexible under stress for this method may not require a complete sphere design. Solving the issue if the craft would be flattened under the g-forces at launch. Or perhaps a longer duration but lower power beaming for less g-forces providing it would be more stable and targeted reliably this way. Hopefully the sphere design is a solution to many posed challenges listed. Update: Excited that the idea is being looked into. PDF by Zachary Manchester and Abraham Loeb of Harvard University, - analysis "architecture for a passively stable sail and beam configuration"
I believe the Coanda effect can work without adjustments from the laser array to keep the craft controlled. Through testing we can figure out the best approach. https://youtu.be/sIrJOrTAJjg?t=87 In this video he also demonstrates how the ball stays corralled by the pressure flow exceeding a 45 degree angle. To avoid the craft being crushed under the g-forces, You might design it to have apertures all the way through, allowing some of the beam to pass through the middle of the craft to relieve the opposing pressure from the other side. While this also can provide even more surface area for the laser beam to work with (walls of the apertures inside the craft). Design testing will be needed to find what works best. Especially if this depletes the Coanda effect desired. For this I believe you can find a low cost solution through companies such as http://www.battelle.org/ who can provide generational evolutionary algorithm computer simulations. (I named the company for an example because I used their demonstration YouTube video later in this post) This may provide an ideal compromise between structural integrity, size of apertures, types of dimples (discussed later), while still able to cause the Coanda effect to happen. If the physics and laws are coded for the testing properly. The beam passing through and/or around the craft might provide a way to divert dust and particles in the path of the craft during its travel. A simple 2D demonstration of evolutionary generational improvements through sample group-testing with boxcars on a challenge track. The boxcars begin with blindly placed random components the program creator coded. Some user settings are available. Best performers are kept for the next generation run. Perhaps a perfected tear drop (or double ended) shape is most efficient. The tail end might be able to assist for orientation alignment. While also occupying the (would be) low pressure area that causes limited achievable speed. An aperture through the middle may be appropriate in this design if it can allow the craft to ride the beam while also being very aerodynamic and reliably secure. Source: "The tear drop is somewhat the most aerodynamic (i.e. has least drag)" This surely will work differently than a sphere design. A sphere will provide its own stabilization from the excess vortex flows occupying the void space on the other side. The tear drops aerodynamics could require a different approach. Rough concept shape of a double ended design with an aperture opening through the middle. 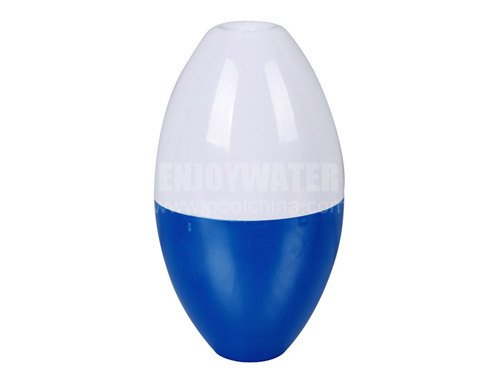 Image of a type of water buoy. There are plenty of videos demonstrating the Coanda Effect with a ping ping ball, But what if it had dimples like a golf ball? Would it be as stable as a golf ball for golfers over using a smooth surface? I would like to see the results. The golf industry has extensively researched the effects of different shapes and depths various dimples can produce. Perhaps the dimples in our case will allow more usable surface for the laser beam. You may have to contact the golf ball folks to find out more behind it and how it can be applied for this project. Golf ball researchers claim the dimples allow for the golf ball to achieve TWICE the speed of a smooth surfaced ball and substantially straighter through the air. For our purpose how do we get the laser light to wrap around the craft and eliminate as much void space as possible from the opposing side letting the beam light encompass the craft as much as possible for maximum propulsion. Could this double the launch effectiveness and produce 40%+ Speed of light? An impressive computer graphic demonstration video by Battelle, a Research and Innovation company that uses simulations to find solutions for complex designs. 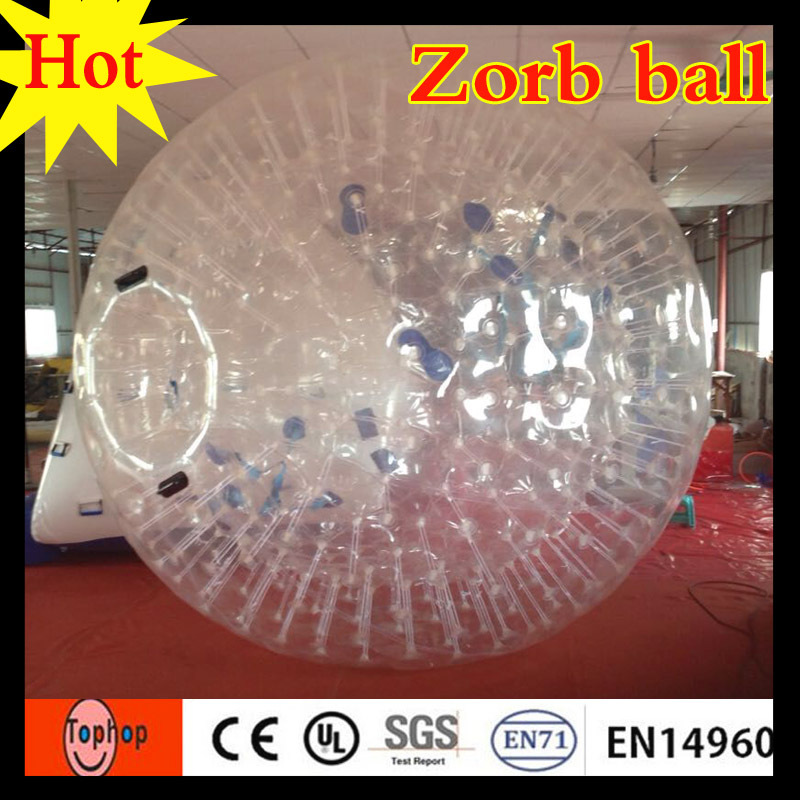 A Zorb Ball: Displays how its dimples can be supported from further inside. Could the golf ball type dimples be useful to other industries that look to reduce drag? For instance, could sky-rise buildings, boats, aircraft, cars, rockets, fan blades, propellers, even bicycles make use of dimples rather than smooth surfaces? Could the same dimple effect work for water applications that want to minimize drag from the trailing wake area such as aquatic vehicles and structures? My guess is that it hasn't been tested because initial impression of the idea would be laughed at by most designers at conception. What if dimples can double fuel efficiency and potential top speed? This type of research may interest other companies to invest into the science produced by this project. Mythbusters had an episode to test dimples on a car. It worked! The crudely made dimples gave ~11% more fuel efficiency. Myth Quote - "A dirty car is more fuel efficient than a clean car because the dirt makes the car more aerodynamic like the dimples on a golf ball." Later inspired from the Mythbuster episode, a UMass student proposed a dimple type modification for vehicles in 2014. The craft could make the most of the beam by having open pores for the beam light to enter (the sphere design) and reflect all around inside the unit making incredible amounts of contact all through the craft (recycling beam energy inside the craft). For stability and trajectory, some of the the beam can be let through the other end to relieve pressures and provide guidance. While the subsurface can be designed specifically for the projects desired results. The design might be extremely complex to make for if its to be designed for a lot of mirrored surface area inside. For this, you can use computer simulations and find the best design cost effectively, second you can 3D print the molding design for the craft and use a specially made aerogel (flexible aerogel for example: https://www.spacefoundation.org/programs/space-technology-hall-fame/inducted-technologies/flexible-aerogel ) for structural integrity and heat/cold tolerance. For application of the mirrored surfacing material, Maybe there's a way to coat the craft by dipping it into the mirror materials liquid form.(?) The main point is to consider maximizing usable surface area (inside and out) the craft can offer for the laser beam. Will the laser array will have to be constructed in the southern hemisphere in order to aim at the Alphas Centauri system?" Yes the laser array needs to be at least 28 deg south and preferably much far south. The higher in the sky that Alpha Cent is the less atmosphere the laser beam needs to go through. The Laser will lose energy and coherence by moving through air. The less air we go through the better. The higher in the sky the is target the better it will be for Star Shot. Put some mirrors on the path to easify the laser path"
It was found to be to expensive to place any mirrors or other optical elements on the light path.